Have you ever imagine that we could turn the moisture from the air into clean water for daily supply? Now it seems to be a great breakthrough with this new technology in place. The new technology, known as Max Water utilizes wind power to extract the moisture molecules from the air and turn it into clean water. As we all know, the air atmosphere consists of plenty of moisture molecules especially in countries that have high humidity. The concept is based on condensation that changes the moisture from the air to water. 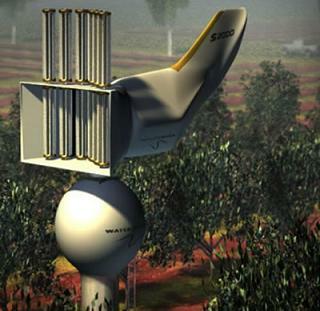 Powered by only wind energy, it is very environmental friendly as there is no additional fuel power required to turn the turbine for condensation process to take place. Amazingly, it is said to be able to supply 10,000 liters of water for daily consumption. However, the estimation could be based on certain environment with high humidity. The whole system is not cheap, costing around $43,000. It may not be useful in developing country that have excess water supply. But for those regions that have water crisis, it is worth the money and this will definitely bring huge benefit to them.